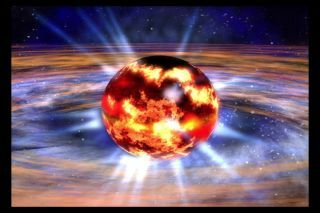 An artist's impression of a neutron star. The cosmic object's 'nuclear pasta' would be located between the crust and the outer core of the neutron star. The crusts of neutron stars — cosmic cousins of black holes — possess a weird form of matter known as "nuclear pasta." Now, scientists have found that nuclear pasta may be even stranger than previously thought, forming defects that bond pieces together into complex, disorderly shapes. This complex nuclear pasta could ultimately doom the powerful magnetic fields seen from neutron stars, researchers say. In the base of the crusts of neutron stars, the nuclei of atoms get crammed together so tightly that protons and neutrons arrange themselves in patterns akin to pasta shapes. Sometimes, nuclear pasta comes in rods like spaghetti, flat sheets like lasagna or spirals like fusilli. Nuclear pasta had been proposed by theorists years ago. In 2013, researchers experimentally detected evidence that this odd phase of matter actually exists. Prior research suggested that nuclear pasta would make it more difficult for heat and electricity to conduct through neutron stars. This, in turn, would make the magnetic fields of neutron stars dissipate much faster than expected. With a lower magnetic field, neutron stars would radiate less energy into space, keeping them spinning for longer. Scientists recently found that there's a scarcity of slow-whirling neutron stars. This hinted at the presence of nuclear pasta. However, past analysis of this new state of matter's properties assumed that nuclear pasta took on perfect, simple pieces. But now, scientists have found that nuclear pasta can form more complex, disorderly shapes. "We are trying to determine ever more detailed properties of extremely dense exotic materials in stars," said lead study author Charles Horowitz, a physicist at Indiana University in Bloomington. Since the scientists have no way of creating neutron-star matter on Earth, they relied on computer simulations of nuclear pasta. These involved nearly 410,000 nucleons — that is, protons and neutrons, the particles that make up atomic nuclei. "Our nuclear-pasta simulations involve more nucleons than any previous work," Horowitz said. The investigators found that lasagna-sheet-like pieces of nuclear pasta could form long-lived defects shaped like corkscrews that connect these sheets. "I have been trying for years to imagine neutron stars as geologic worlds with different kinds of nuclear rocks, faults, mountains," Horowitz said. "Then, one molecular dynamics simulation found a mistake — a defect in the otherwise regularly perfect pasta shapes that persisted for a very long time." These misshapen pieces of nuclear pasta could make neutron stars even less conductive to heat and electricity than the perfect pieces of nuclear pasta that prior studies had modeled. This could explain the spectrum of light from the system MXB 1659-29, which possesses a neutron star. "X-ray observations of neutron-star crust cooling can provide information on exotic pasta phases buried a kilometer under the surface," Horowitz said. "These observations can then tell if the pasta is disordered and have low electrical and thermal conductivities." The existence of complex, disorderly nuclear pasta "may tell us the fate of the huge magnetic fields in neutron stars, which can be a trillion or more times stronger than the Earth's field," Horowitz said. "If the conductivity is low, the great electrical currents supporting the fields may dissipate in about a million years." The scientists will detail their findings in an upcoming issue of the journal Physical Review Letters.